After surpassing quality, technology and safety standards in all disciplines of aircraft production, the Airbus U.S. Manufacturing Facility has earned EN/AS 9100 certification. 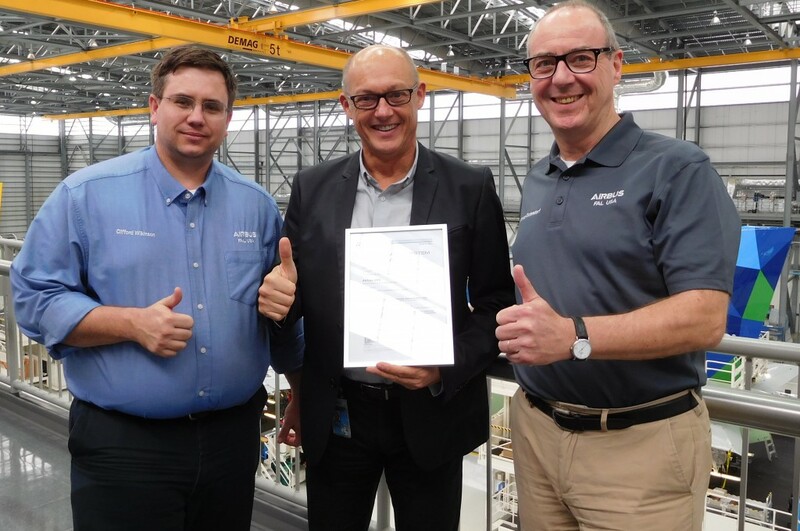 Airbus Quality Surveillance Supervisor Thierry Coutand presented a certificate recognizing the EN/AS 9100 achievement to the Mobile team who led the certification process. “The EN/AS 9100 certification recognizes that our activities are performed in such a way to continuously improve the satisfaction of our customers,” he said. The Airbus U.S. Manufacturing Facility continues to make advancements in all levels of manufacturing. Nearly a year ago, the manufacturing facility achieved the U.S. Green Building Council’s LEED Silver certification having exceeded the standards of energy efficiency and waste reduction. The EN/AS 9100 certification is based on the ISO 9001 Quality Management Systems standard. The certification is the international standard of quality for the aerospace companies and their supply chains. This certification helps ensure continual improvements in all segments of aircraft manufacturing.